From the Kitchen: Chocolate Hazelnut Bread Pudding | Stahancyk, Kent & Hook P.C. 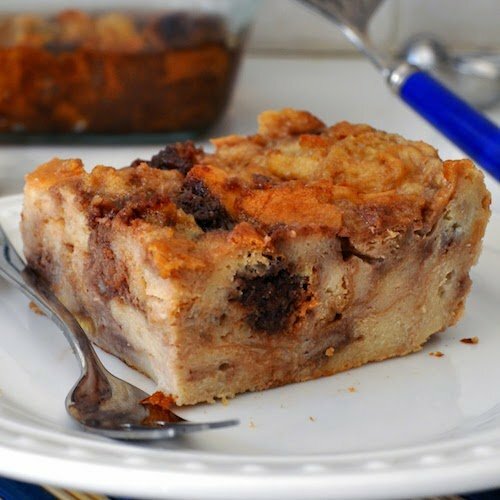 A slice of chocolate hazelnut bread pudding. If Nutella on toast was part of your childhood, this recipe is for you! Bring back those early memories and ring in the New Year with my reinvented classic. Combine the bread cubes, chocolate and hazelnuts in a 13-by-9-by-2 inch baking pan. Whisk eggs, half and half, Nutella, sugar, Frangelico, vanilla extract, almond extract, and salt in large bowl to blend. Pour over bread cubes. Let stand for 30 minutes while occasionally pressing bread into custard mixture. Bake until pudding is set in center, about 40 minutes. Cool slightly. Serve warm with fresh whipped cream or ice cream.